A quarter of a century after its initial publication, The Classroom Arsenal remains pivotal in understanding and challenging the relentless promotion of technology to reform education. This seemingly benign education technology juggernaut carries forward the momentum of military agendas in man-machine systems detailed in the book. Promoters continue to flood schools with technology and its (still unfulfilled) promise of cutting edge, "personalized learning." Meanwhile, they continue as well their insatiable pursuit of federal funding, educational legitimacy, corporate profits, and access to student subjects and their accumulated learning data for product development. Less understood, though, is a companion enterprise, there from the start, to replace teaching and learning in traditional classrooms by efficient automated systems that manage and monitor human cognition and learning for high-performance systems, from weapons systems to high tech corporations. 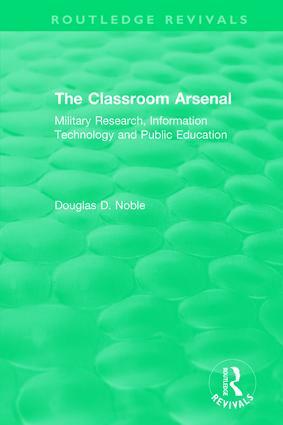 As education is moved　imperceptibly away from its traditional humanistic aims and from the classroom itself, the goal of this human engineering project, the depersonalized accumulation of cognitive components for a 21st century militarized economy, best befits the book’s original title: "The Human Arsenal." This ongoing military/corporate-sponsored enterprise continues to impact education today, largely unnoticed. One example is the federally-funded Advanced Distributed Learning Initiative (ADL), which has been a major force behind the implementation of electronic learning systems, now used in all Defense Department and federal employee training. With the Defense Advanced Research Project Agency (ARPA) ADL is developing structures to capture students’ soft skills, and the Army Research Laboratory is developing "intelligent tutoring systems" to enable "instructional management of affect, engagement, and grit (perseverance)." ADL through the Department of Defense has developed Experience API, a learning technology that can monitor all student online and offline interactions and archive these in date lockers or learning record stores. ADL has already impacted thousands of school districts through nonprofits such as IMS Global and Future Ready Schools, part of an industry massively subsidized by high tech corporations and valued at $255 billion annually. A $90 million Advanced Research Projects Agency for Education (ARPA-ED), modeled after the military’s ARPA,　has been proposed to fund "dramatic breakthroughs in learning and teaching." These include "digital tutors as effective as personal tutors" and, with the Navy’s Full Spectrum Learning project, "data collection tools for personalized education modeled after corporate data analysis that identifies consumer patterns and preferences." ADL is just one example of how the military/corporate ed tech enterprise is changing public education by hollowing　it out into something that can be digitized, data-driven, automated, and monitored. Its promoters envision education as children interacting with online learning systems where, based on past performance, algorithms will serve up what each student needs to know next. Through this digital curriculum, students create virtual educational identities at very young ages and learning devices are watching students as much as students are watching them. Such is the education landscape presaged by The Classroom Arsenal a quarter century ago, whose origins and trajectories need to be deeply understood now more than ever.